The amount spent on business purchasing far exceeds consumer purchasing. 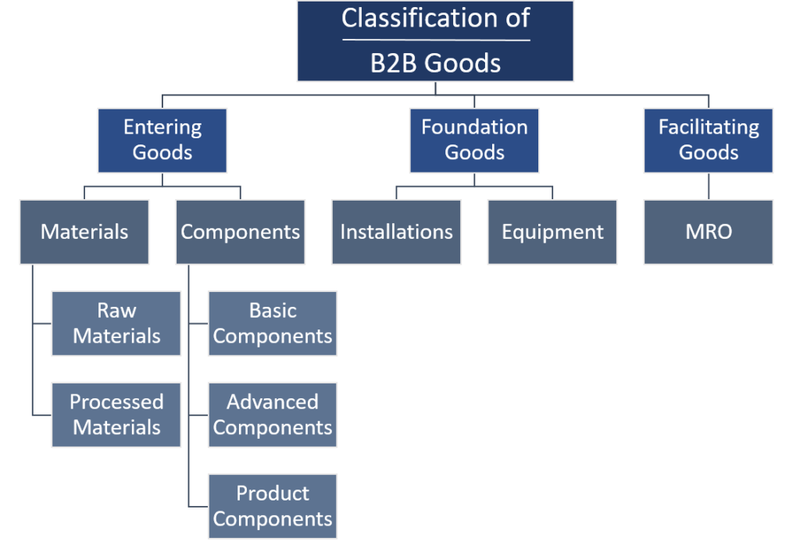 That makes it so crucial to understand the classification of B2B goods. Nonetheless, many marketing courses do not cover the classification of B2B goods sufficiently, or do not include B2B goods at all. Too much focus is on the consumer side – but understanding B2B goods and the classification of B2B goods is actually much more important. Eventually, they account for much more business – so gain an advantage by understanding the differences. As discussed before, B2B offerings are categorized by the use to which they will be put, unlike consumer offerings, which are categorized by how consumers shop. The primary categories of B2B offerings are entering goods, foundation goods and facilitating goods. Let’s split them up and look at the detailed classification of B2B goods. Entering goods can be split up into materials and components. Raw Materials– These are products obtained through mining, harvesting, fishing, etc. They stand at the very beginning of the production inputs and are unprocessed. They are key ingredients in the production of higher-order products. Processed Materials– These are products created through the processing of basic raw materials. Thus, in contrast to raw materials, they have already been worked on and are processed in some way. Sometimes, the processing refines original raw materials while in other cases the process combines different raw materials to create something new. For example, several crops including corn and sugar cane can be processed to create ethanol. Components are made out of materials, but may not be produced by the company itself. Often, components are bought-in from specialized companies and enter the production process directly. Basic Components– Basic components are products used within more advanced components. These are often built with raw material or processed material. An example is electrical wire. Advanced Components– These are products that use basic components to produce products that offer a significant function needed within a larger product. An advanced component does not stand alone as a final product! For instance, in computers the motherboard contains many basic components. However, without the inclusion of other products, like memory and processor, it would have little value. Product Components– These are products used in the assembly of a final product, although they could already function as a stand-alone product. An example would be dice included as part of a children’s board game. Foundation goods mainly include installations and equipment. Installations – Installations refer to facilities such as buildings and offices. Without them, running the business and producing goods would not be possible. Equipment– These are products used to help with production activities. An example would be a conveyor belt used on an assembly line. MRO (Maintenance, Repair and Operating) Products– These are products used to assist with the operation of the organization but are not directly used in producing goods or services. Office supplies, cleaning supplies and copiers as well as parts for a truck fleet and natural gas to heat a factory fall into this category.